A Saudi woman sits in the driver's seat with a Lebanese driving instructor as they test-drive a car during an automotive exhibition for women in the capital Riyadh on May 13. The dark side of Saudi Arabia's reform campaign became apparent last week when 10 activists, mostly women's rights campaigners, were arrested as the Saudi media denounced them as "traitors." 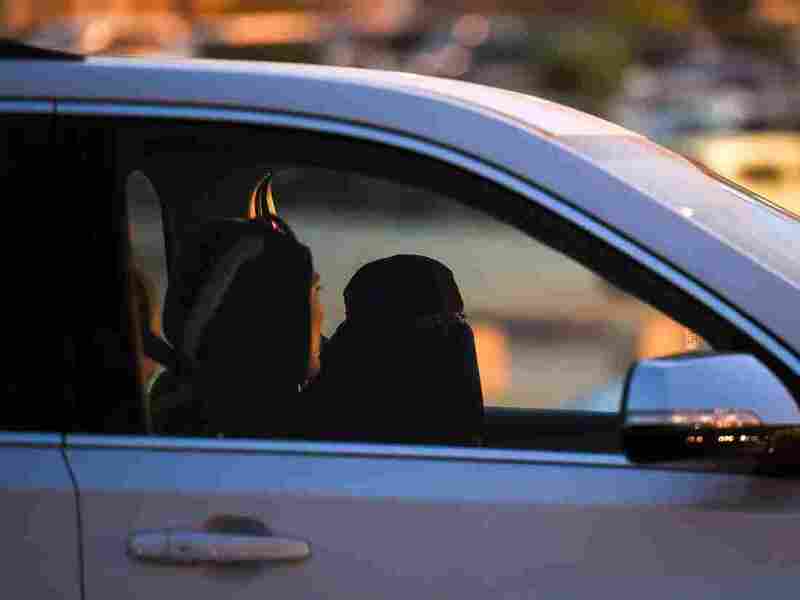 The clampdown comes just weeks ahead of the kingdom's much-publicized June 24 lifting of its prohibition on women driving. The arrests were widely condemned by Western human rights organizations. But even supporters of the kingdom were taken aback by the move. "It's a very surprising development," said Ali Shihabi, founder of the Arabia Foundation, a Washington think tank close to the Saudi leadership. "Mistakes are inevitable, and this sure looks like one." So far, the State Department has made no comment about the activists' arrests. Three generations of activists were targeted, including Loujain al-Hathloul, a 28-year-old social media figure; Aziza Al-Yousef, a 60-year-old mother of five; and Eman Al-Nafjan, a university professor and popular blogger. Also arrested was Madeha Alajroush, a psychotherapist in her mid-60's who was part of a group of 40 women who mounted the first challenge to Saudi Arabia's driving ban from a Riyadh parking lot in 1990. The unprecedented style of the arrests — including naming and shaming the women, who ordinarily would have been asked to report to authorities rather than being arrested at their homes — suggests Saudi Arabia is planning for trials and more arrests to keep activists in line, says Kristin Smith Diwan, a scholar at the Arab Gulf States Institute in Washington. "They were taken from their homes," she says. "It's a relatively new way of imposing order in Saudi Arabia, as is the quick willingness to name these women. I think the way they were publicly shamed speaks to a new Saudi Arabia, to get society behind the moves the government has taken." The crackdown comes at a time when Saudi Arabia's powerful Crown Prince Mohammed bin Salman has portrayed himself as a revolutionary leader determined to drag his country into modernity. Saudi women applauded when the 32-year-old prince, known as "MBS," expanded women's rights last year, by allowing women to enter the military for the first time and opening some cultural and sporting events to women. He also reined in the country's religious police, who enforce strict rules of public behavior that fall most heavily on women. "The vehemence with which these activists are being attacked is very surprising," said Gregory Gause, a professor at Texas A&M University. "The campaign certainly takes the bloom off the rose of the crown prince's efforts to portray himself as a champion of improving the position of women in Saudi society." Saudi women check out cars at an automotive exhibition for women in the Saudi capital Riyadh on May 13. Jamal Khashoggi, a prominent Saudi writer in self-imposed exile in the United States, said the arrests reveal the strategy of the young crown prince, who appears to have consolidated enormous power. "It's a war on activism," he says. "He wants the people to step aside and accept what he is giving them and he will lead them into the future." When the government first announced it was lifting the driving ban last September, activists and bloggers were warned — through targeted calls from people they believed were from the government — not to speak to the media or post on social media about the lifting of the ban. Many went silent after the warnings, fearing they and their families could be subject to travel bans, a punishment the government uses to deter dissent, say Saudis who don't want to be named out of fear of government reprisals. After last week's roundup of the driving activists, a government statement said the arrests were for "suspicious contacts with foreign entities" and offering financial support to enemies overseas, without further elaboration. "This doesn't make sense because many of the people had basically been keeping quiet over the past year," said Kristian Ulrichsen of Rice University's Baker Institute for Public Policy. "They could have been powerful ambassadors for the new Saudi Arabia. Instead, they are being branded as traitors. I think it might mask a deeper underlying struggle within Saudi itself." Though the style of arrest was unusual, it is not the first time that Saudi dissidents have been arrested, as the crown prince consolidated power after his father King Salman bin Abdul-Aziz Al Saud designated him as his heir in June 2017. Late last year, there were high-profile arrests of prominent business elites and members of the royal family, who were held captive at the Ritz-Carlton Riyadh on corruption charges. An earlier crackdown targeted dissident clerics and activists. But the latest arrests and their timing have raised more questions than answers for Saudi watchers. "Has MBS realized that he can't go too far too fast?" asks Ulrichsen. "Are these arrests just the tip of a much bigger iceberg where, as with everything else, 95 percent is below the surface? It could point to the limits of change." "It's a mistake to arrest these women," said Bernard Haykel, professor of Near Eastern studies at Princeton University. "It might be an overreaction to please the traditionalists, as we come to the date of women being allowed to drive." But "unless there is ironclad evidence against these women," Haykel warns, the arrests and trials "do not inspire confidence in the West that the country is headed in the right direction."